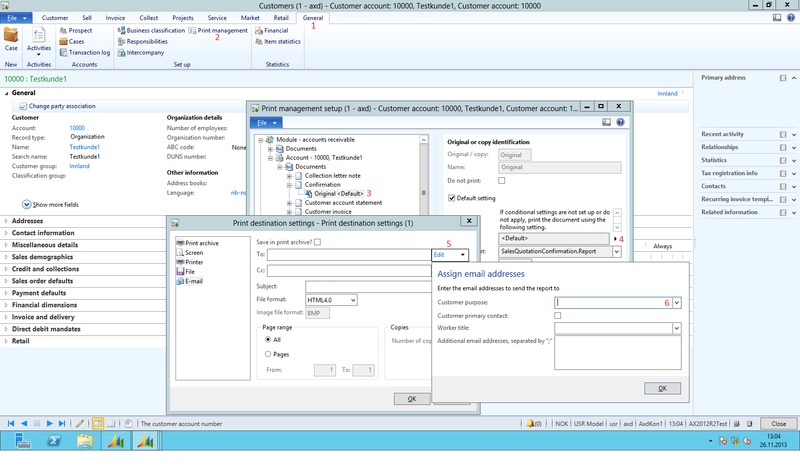 In AX 2012 R2 CU7 Microsoft introduced a more refined way of working with emailing documents to customers. The feature introduce the possibility of using email addresses on the customer primary contact, a certain title on a customer contact or a email with a corresponding purpose to send a given document to. 3. On the preferred document: right click on the Original document and choose override or right click the type and add a copy. 4. Click the arrow on the Destination option and select Printer setup. 5. When email is selected you can choose the edit button on the recipient (TO or CC) and select the options shown. 6. The solution will select the email addresse with the given purpose in these field. Have a DAXing good day!